Image caption In London, campaigners protested against "medievalism and barbarity"
Hundreds of people have held rallies across the world in support of an Iranian woman sentenced to death for adultery. Sakineh Mohammadi Ashtiani was originally told she would be killed by stoning but the sentence was put on hold following an international outcry. In London, campaigners protested against what they described as "medievalism and barbarity". Protesters also marched in Toronto, New York, Paris, Berlin and other cities. In London's Trafalgar Square, campaigners called on the international community to "make the world stand still". In Sweden's capital Stockholm, protesters signed a large petition calling for Ashtiani's release. However, her death sentence remains in place. She has already received 99 lashes for what Iranian officials called an illicit relationship outside marriage. Then, following the trial of a man charged with murdering her husband, the 43-year-old mother of two was found guilty of adultery - a crime punishable by death. Earlier this month, officials in East Azerbaijan province said the execution would be "temporarily halted" pending a decision by Iran's judiciary chief, Sadeq Larijani. It was announced that the method of execution would not be stoning, but she remains under sentence of death with her case due to be reviewed within a fortnight. Rights groups have warned she could still be hanged. 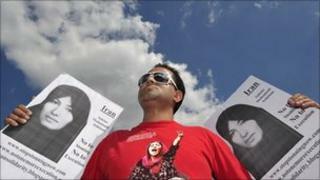 Campaigners express hopes that Saturday's rallies would keep Iran under pressure to release Ashtiani. She has been in jail in the north-western city of Tabriz since 2005. Iran's judiciary has been told to observe a moratorium on stoning, but critics say the practice continues. Amnesty International says at least six people have been stoned to death in Iran since 2006. Another 15 people were spared, the human rights group says.